You must be looking for Halloween costumes for your kids by now. It’s not the season of giving, it’s the season of scaring! It’s not the season to be merry, it’s the season to be scary! Love isn’t in the air, but maybe bats and witches are. It’s not any other holiday on your mind, it’s Halloween! And on this special, fearful, day you can be whatever you want to be! Or at least dress up to be whatever you want to be.. 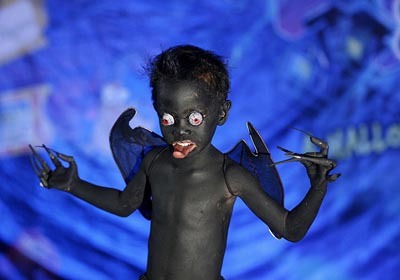 It should really be the season for dress up because costumes of all manner of shape and size pop up out of the shadows and into the dim light of the night. Kids in particular, have the go signal to dress up and be just about anything that they fancy to be. Or at least anything that fancies their parents budget. With that in fearful mind, perhaps these Halloween costume ideas for kids will help for all the busy trick or treating your little critters will be doing on Halloween. 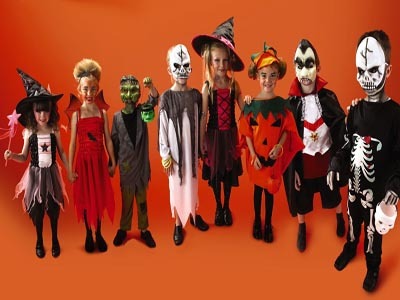 Take a look at these easy Halloween costumes for your children that you may get on Halloween 2013. Okay, so you think the price of buying or renting a costume for your little critter is scary. Fear not the price, only the things that go bump in the night! Take a look at these homemade Halloween costumes for kids that will scare anyone and anything except the money from your wallet. This costume is easy to put together it’s frightening. All you really need are old black slacks, an oversized shirt or blouse, some handkerchiefs or scarves , and a toy hook and costumed gold jewelry. All inexpensive stuff lying around in your basement or the last items being at a toy store. But all accessible and yes, cheap. The eye patch can be put together with an old patch from worn out sunglasses and string. 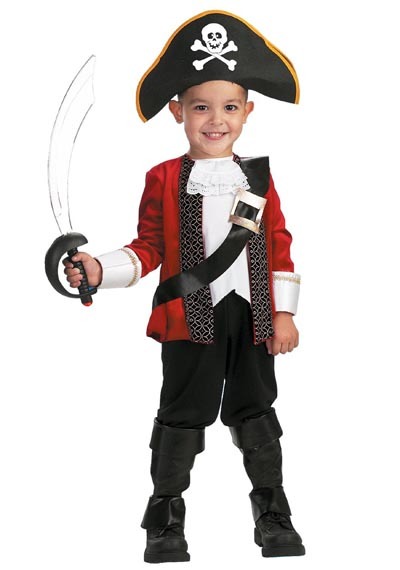 Stuffed bird optional, but once completed your little pirate is ready to set sail. The furry sweatshirt, is really just that. An oversized sweatshirt. The furry ears can be attached to the hood using safety pins. Any light, neat, and clean old box will do for the litter box. Stuff with stuffed toys as necessary. 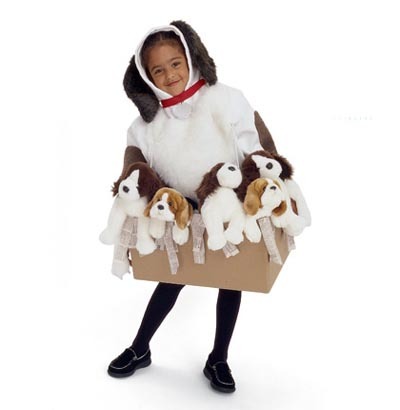 Learn more about pick of litter costume. 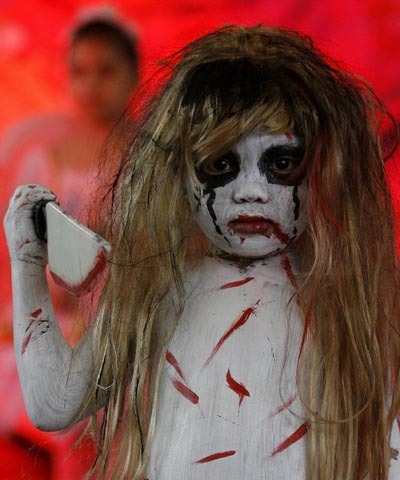 Grab this cute Halloween costume for your little girl. 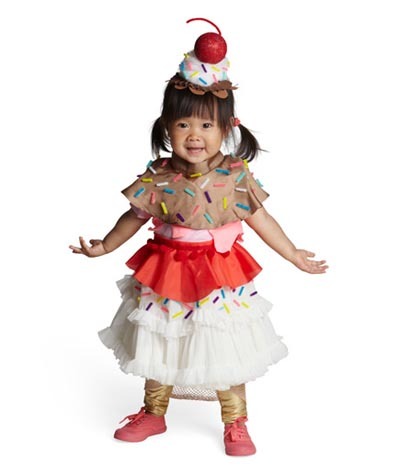 The colorful combinations of fabric make this costume cute for anyone who wears it. 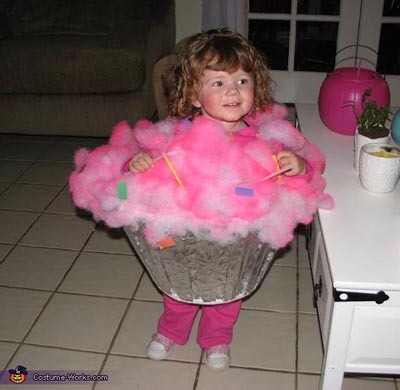 Learn more about this ice cream costume. I think..? I’m not sure what this monster this boy’s supposed to be. I think it’s the Filipino monster called the Manananggal. Well, whatever he is, I’m sure you’ll agree he’s really scary! He modeled the costume for a good cause, to raise funds for the Philippine Animal Welfare Society (PAWS) Animal Rehabilitation Center. As their name implies, the group rescues stray dogs and cats who have suffered frm cruelty and neglect. I’m not sure if he raised funds or hairs with his costume. What’s she supposed to be? From the same competition as #1 above, this girl also provides a really scary look. I’m even more unsure as to what she should be. A mad doll? A zombie child? A knife wielding killer? Whatever she is, she is just as, if not more scary than the first. 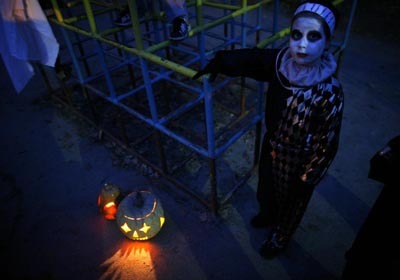 From Central Sofia, we get this image of a girl dressed as a Harlequin standing beside a lit pumpkin at night. Harlequins and other clowns are supposed to make people laugh but I don’t think she’ll get laughs from anyone. Shivers maybe. These costumes are for the female little critter. Guaranteed to make even the boys scream in fright. Well okay, maybe that’s going a bit far, but these costumes will indeed make an impression, frightful or otherwise..
Just get a blue dress and stripped stockings and your little girl will soon be ready to enter the Rabbit Hole. 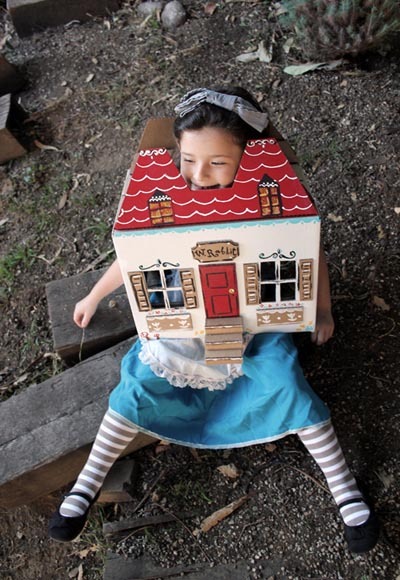 But why not set it apart from the rest by constructing Rabbit’s house, and having Alice popping from it like so? A simple, cardboard box, pens and crayons, and a lot of creativity, will go a long way into creating Rabbit’s house. Learn more about this Alice costume. 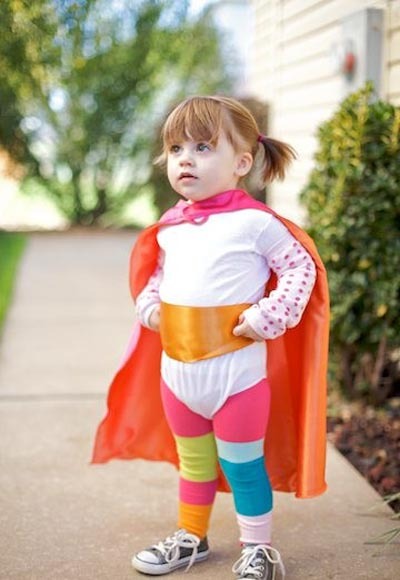 Get your little baby a cute and colorful costume with this idea. See how cuter she can be wearing that pink-colored cupcake. she just wore pink pajama pants and sneakers and she’s ready to start that trick or treat. 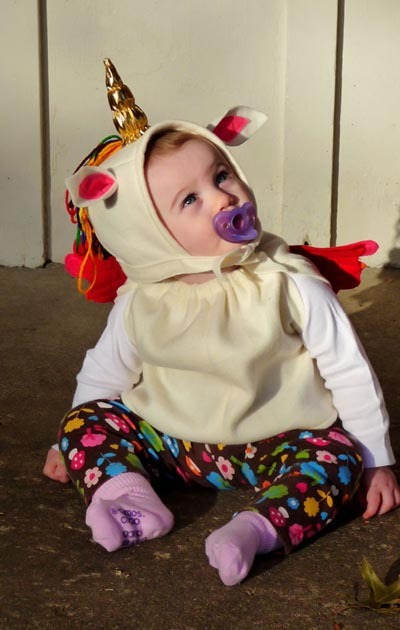 Parents, you can have a unicorn of your own. You need a hoodie with one horns on it. Now it’s the boys’ turn to turn heads and raise hairs (hopefully), with these costume ideas from all over. Have you seen Elvis Presley in his early days? Then he must be looked like this little boy! 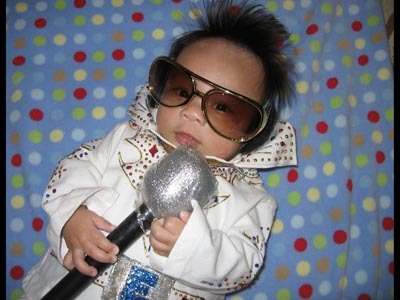 This cute little Presley, with matching signature shades, raised collars and mic, totally rocks in his little cute costume! I totally love it! How about some Star Wars based costumes? Have a look of this cool and creative Halloween costume featuring Yoda from star wars. 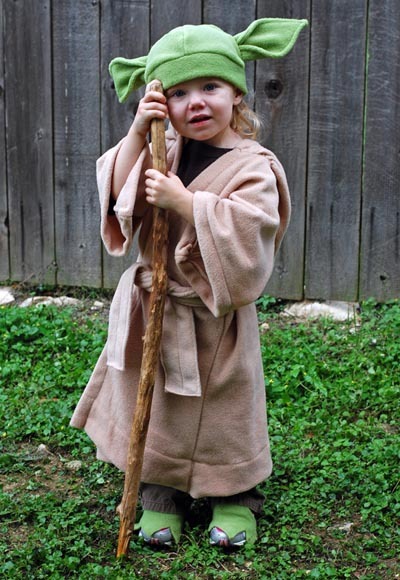 The brown robe and the green cap, with that obviously green long ears make it look like really a young Yoda. Of course, don’t forget the signature wooden stick that Yoda always carry in the movie. Freak those neighbors and friends who have arachnophobia with this cool spider halloween costume. 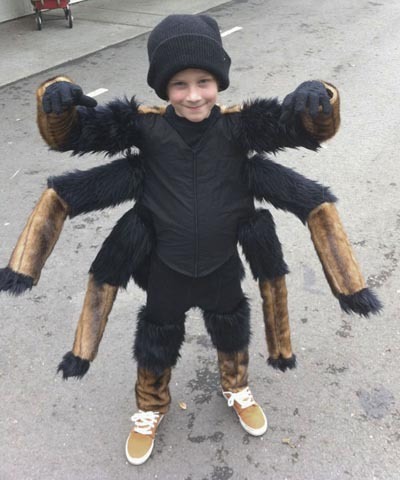 The additional four legs in the sides, plus the hands and feet covered with the same colors of fabric make this costume look like a Tarantula. 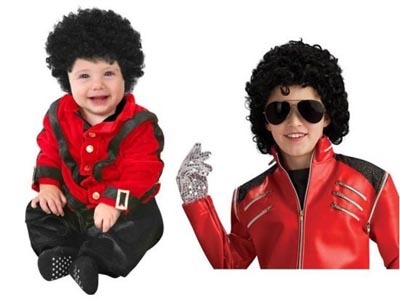 Being costumes for the little boys, the King of Pop is a perfect choice for Halloween. Just get a tight, red jacket, glittery gloves (pasting glitter gel on cloth gloves will do perfectly), and skin tight, black slacks, with white socks, and black, leather shoes, for the Moonwalk. Don’t forget the afro wig. A great idea for the holiday would be the whole costume plus some spooky makeup for Michael Jackson in Thriller. Even though it’s Halloween, let’s try not to scare people anymore. Besides, kids were made to be cuddled anyway, not feared. 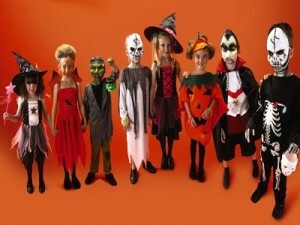 With that in mind, check out these costumes that will surely max out the cuteness in your little critters.. I mean tykes. 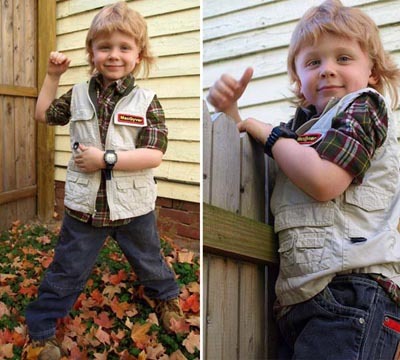 This costume is ideal for little toddlers. The classic character Little Red Riding Hood lendsherselfvery nicely to the holiday. 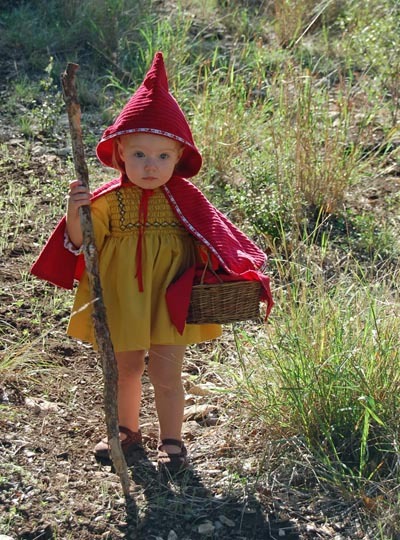 All you really need is any little dress for your little toddler, a clean walking stick, a basket, and well, a good red hood. Big Bad Wolf, not included. Okay, I confess, I know David Bowie, but I’m not old enough to have remembered his “Ziggy Stardust phase” whatever era that was. Cute, unique, and even retro rock, this look has it all. 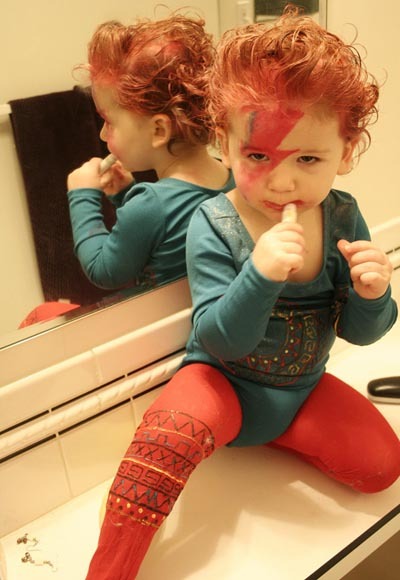 The tights will have to be sewn with the appropriate “Ziggy Stardust” look, and the face paint is easy enough. Again, I recommend just getting a wig for the big hair instead of risking any kind of hair treatment for your kid. 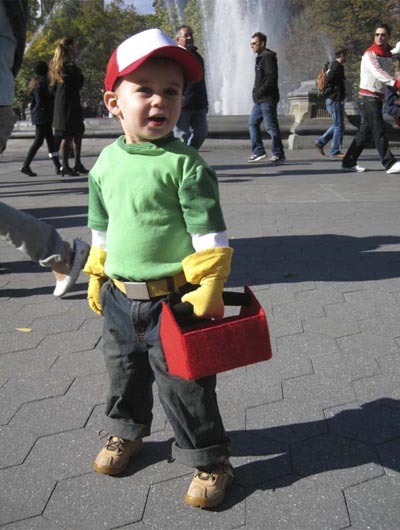 Handy Manny is handy at anything, a real handyman, especially looking cute! Just like patching a leak, or replacing an old bulb, Handy Manny is efficient and effective in his workmanlike green sweater, jeans, and sneakers. Just don’t include real tools please. Cute and delicious. Japanese is my favorite food. 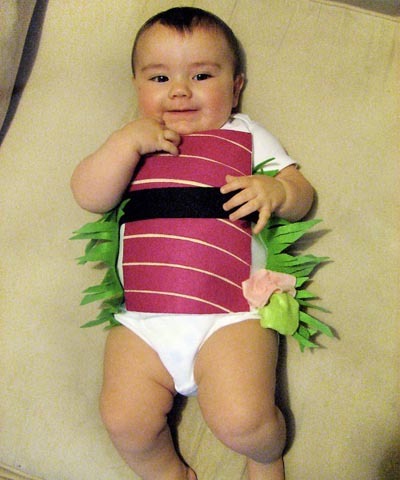 Just dress up your baby in all white, and get a stuffed pillowcase behind her for that “Sushi/Sashimi” look. Happy Halloween to all the kids and kids at heart out there! This look is absolutely a buzzer beater for those looking to make a quick score, or a fast break for a costume party. Still, I think you’ll agree it makes for a winning last second play for the win. The jersey, shorts, and sneakers are all self-explanatory. The basket and ball can easily be bought at any toy store and simply attached to the jersey, around your child’s arms using wide elastic. He shoots, he scores! Never saw the megafight everyone wanted happen? Maybe Paqiuao and Mayweather may never come to pass, but as these two show, you can have the next best thing: having your child dress up as Paqiuao or Mayweather! Just like in the Pirate look, everything you’ll ever need to get this done is lying around in the house. The gloves are actually oversized socks sewn together to look like boxing gloves. The belt is actually just strong cardboard. Get ready to rumble! This look brings back memories of Steve Irwin, RIP. What a great guy gone too soon. You won’t need to wrestle with real crocs to get this costume looking ready for the wild. Simply cut out the shape of the croc on green upholstery foam. The safari look is also very self-explanatory, with khakis and hat easily purchased anywhere. Same goes with the toy binoculars.